This is a stunning hat. 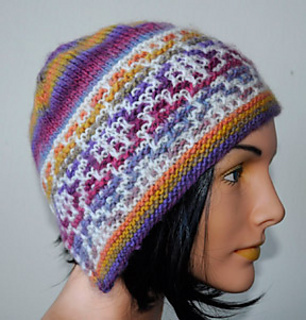 The mosaic design is made by slipping stitches, so you do not have to change colors within the row. The bottom part is worked back and forth, and the crown is worked in the round. 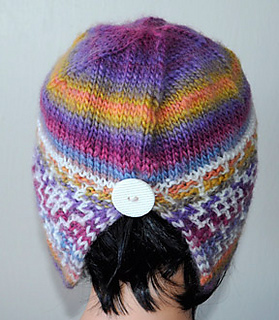 You can sew up the seem in the back, or you can leave it open, add a button atop the slit and wear like an earflap hat. See the matching Mosaic Tile Scarf to complete the ensemble.